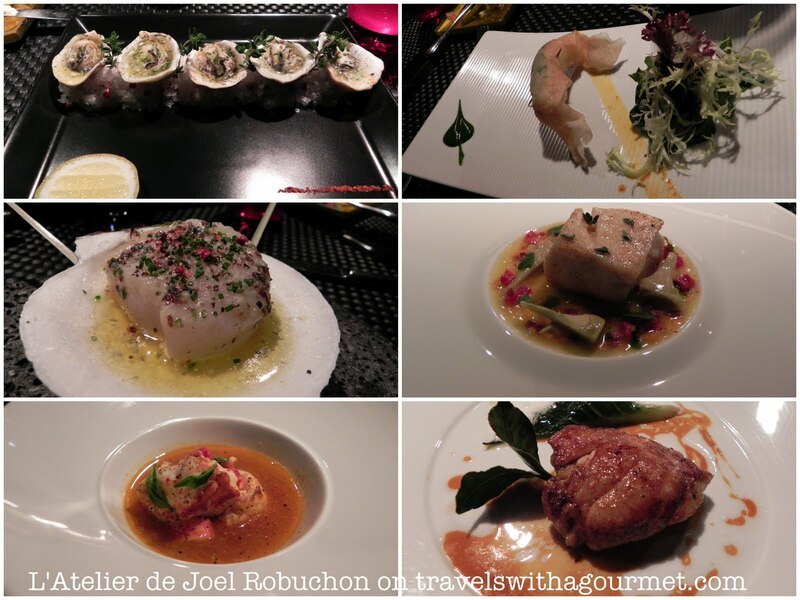 The last few days before we were meant to return to Marbella, I went to dinner with my sister and her husband to one of our favorite restaurants in Las Vegas – L’Atelier de Joël Robuchon. It’s always a pleasure to go back to L’Atelier because it’s concept of haute cuisine tapas eaten at the bar is so non-stuffy that it makes the meal more relaxed. 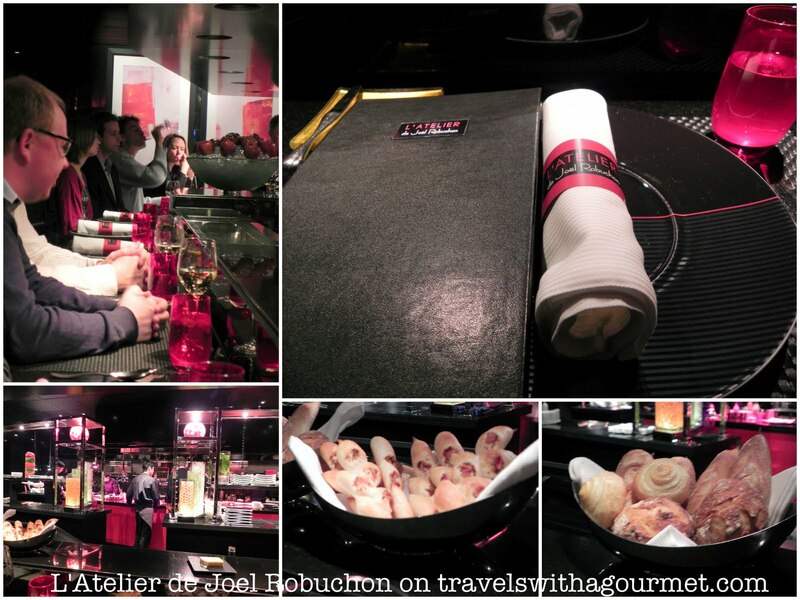 Last year we had dinner at the luxurious adjacent restaurant – Joël Robuchon where executive chef Claude Le Toic spoiled us with so many extra treats that we still remember that evening. We arrived to a half-full restaurant slightly late for our 8:00 p.m. booking and were lead to the bar, right smack in the middle where we could see all the action in the open kitchen. That evening, chef Claude was at L’Atelier so we were able to say hello. We were given our menus and after a careful discussion of who would order what so we could taste each other’s food, we decided against the two multi-course prix-fixe menus and decided to go a la carte, choosing three dishes each from the small plates selection. We also ordered three different red wines by the glass to accompany our meal – I chose a pinot noir from Oregon, my sister had a classic pinot noir from Burgundy and C had a shiraz. A basket of homemade bread (at least four kinds) was left on the counter and when we asked for some of the fantastic bacon bread from next door, we were given that too. Our wines were served along with the amuse bouche – a lukewarm parmesan foam which was delicious and a perfect teaser for the goodies to come. While we waited for our first plates to arrive, the chef sent over a plate of jamon Iberico with some pan con tomate (tomato-topped toasted bread) which we thoroughly enjoyed. Next came our three “appetizers” – les huitres (oysters) for me, la langoustine (one of Robuchon’s signature dishes) for my sister and la saint-jacques (scallop) for C. The five tiny oysters in their shell were served on a black plate with a sliver of lemon juice – each bite of the beurre d’Echire-poached (unsalted Echire butter) oyster was divine, the saltiness of the oyster juice perfectly complimented by the creamy melted butter. The langoustine (Dublin-bay prawn) was crispy like tempura but wrapped in filo-pastry with a basil leaf – again, a delightful mouthful of crunchy prawn. The scallop was a large one served on the shell and also poached in butter flavored with seaweed – sweet and salty all over again. All three first plates were delicious. Our next three plates were: le merou (grouper) for me, le homard (Maine lobster) for my sister and le ris de veau (sweetbreads) for C. My merou came with an artichoke barigoule – a Provencal way of cooking artichokes with tomatoes and onions in a vegetable broth and was light and flaky but lightly flavored by the tasty thyme-infused broth. R‘s lobster was poached in a spicy broth with a hint of lime that tasted like a very sophisticated lobster-version of a tom yum soup. C’s sweetbreads was actually one large piece seared in a pan and flavored with fresh laurel leaves – crispy on the outside and soft on the inside. We were thoroughly enjoying our dinner and were all looking forward to our third plates which came soon after: steak tartare for me (I asked nicely if they could give me a half-portion since this was listed as a main course rather than a small plate and they very kindly obliged), le jarret de veau (veal cheeks) for R and the sole for C. Again, all three were stunning – the sole served with ginger and leeks giving a very Asian-style twist to this classic fish, the veal cheeks were stuffed into ravioli and came with thinly-sliced fried artichokes and my mini-steak tartare, perfectly seasoned and spicy which came with a small salad and some crispy fries. As we were debating on what to have next, the chef came over and offered us a selection of cheeses – six slivers of fromage de brebis (sheep’s cheese), fromage de chevre (herb-covered goat’s cheese and a crottin de chavignol), some Reblochon and Livarot, a triple creme explorateur plus another I can’t remember. Another basket of bread was served, this time with slices of walnut and raisin bread to accompany our cheese platter. I love cheese so this was a perfect end to my meal but as we were on a roll, we decided to split two desserts between us – le citron and le chocolat which was more than enough but again, the chef very nicely sent out another dessert: les tartes, five tiny slices of tarts – raspberry, chocolate, apple, a frosted flake-topped one and a very thin custard Swiss tart. Needless to say, we managed to polish them off as well. Espressos which came with a tiny logo-topped chocolate truffle to end our gastronomic evening. 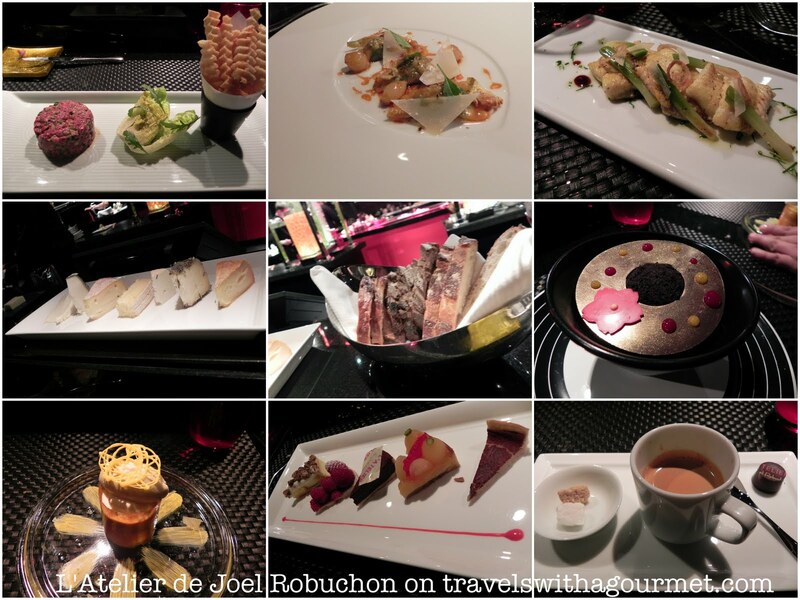 L’Atelier never disappoints (I’ve been to the one in Paris a few times and the one in Vegas twice) – the concept is fun but the wonderful flavors are consistent and although classic in nature, they always have a twist. L’Atelier is definitely going on my best meal list for 2010. Open daily for dinner from 5:00 p.m.
Tasting menus start at $75.